Where is the closest rest stop? Where is the next one in your direction? Or one with wifi or a RV dump? This is the only app that shows you directional access right on the map! 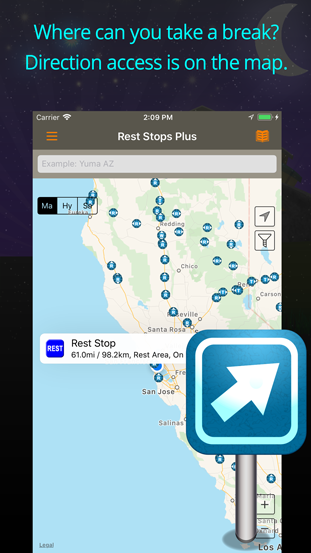 What's in this Rest Stops Plus app for USA and Canada: Over 4,000 Welcome centers, turn outs, service plazas, scenic vistas and rest areas broken down by heading. A detail view lists each rest stops amenities like restrooms, picnic tables, vending machines, pet-friendly, RV dump, handicap accessible, security and even wi-fi. You've had it happen; you're on a route that you don't know like the back of your hand yet. You were unfamiliar with that part of the road, so you get out your heavy books and maps to plan your next stop or you can fiddle with your GPS unit which is loaded with stuff you don't want. But the economy is causing states to close and re-open rest areas all the time. This app tries to stay current with news and user reports but there will be mistakes. You can submit corrections from each point. Rest Stops Plus has a unique filtering system. Only heading northbound and don't want to see southbound rest stops that you can't use? Only want ones with a RV Dump or Wifi? You can filter Rest Areas and Turnouts by the direction you are heading or select amenities! The Rest Stops Plus data is stored on your phone, so calling upon a website for information is not necessary. This is great for improving speed when you're in rural areas or otherwise out of range for decent service. Don't take even one more trip without Rest Stops Plus. Download this app now for a more comfortable travel stop experience every time you travel. The biggest thing this app can't provide is whether they are clean. - Another first from AllStays, now you can see directional access at a glance right on the map. -Added advanced filtering so you can select exactly what amenity you want to see.